Enjoy our spacious oceanfront condominium. 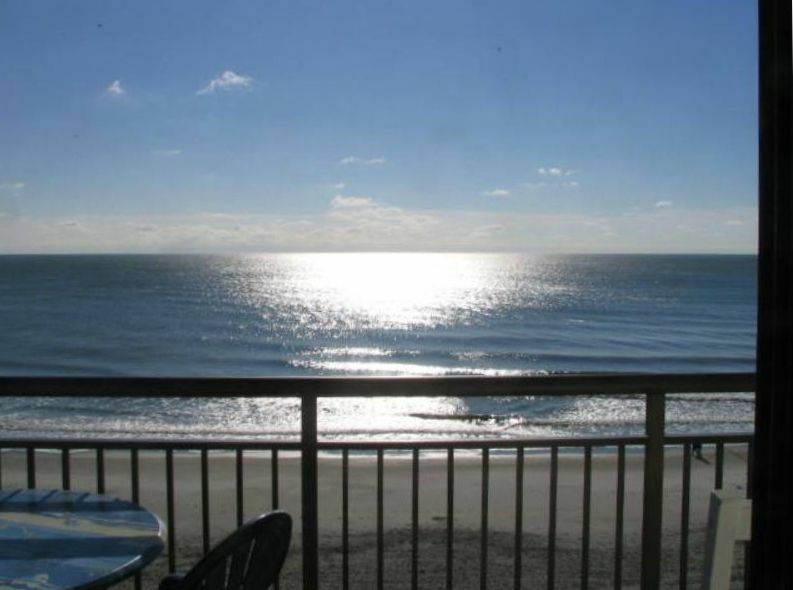 It is a colorful 2- bedroom/-2 bath condo at the popular, beautiful, and recently renovated Bluewater Resort in Myrtle. The floor plan of my condo includes a master bedroom with two queen size beds; a second bedroom with one queen size bed, and the living room has a couch that converts into a queen size bed. At the oceanfront end of the living room and master bedroom there are sliding glass doors that open onto the balcony. The floor plan also includes laundry room with a washer and dryer, a fully equipped kitchen and two full baths. Summer is a special time in Myrtle Beach. The cool ocean breeze moderates the heat of summer as you enjoy a spectacular view of the beach from our oceanfront balcony. When and I stay there, I leave the bedroom curtains open, so the rising sun wakens me. The view of the sun rising over the ocean is often spectacular. I also enjoy spending the afternoon on the shaded balcony, and walking barefoot on the beach at low tide. Springmaid Pier and Damon’s Grill are both less than a mile south on the beach. You will be able to swim in the warm waters of the Atlantic, or enjoy one of the eleven bodies of water available at the Bluewater. These include an ocean front pool, an indoor/outdoor pool, hot tubs, and a small lazy river (across the street.) When it turns cool you can turn on our electric fireplace so you can be cozy while watching a football game or your favorite shows on our large flat screen TV. There are 47-inch flat screen TVs in the living room and master bedroom, and a 32-inch flat screen TV in the second bedroom. You will be at the south end of Myrtle Beach, South Carolina on South Carolina’s famous Grand Strand only a five-minute drive from Myrtle Beach airport. If you are flying in, car rental is available right at the airport. It is a short 10 minute drive to the large Coastal Grand Mall which hosts movie theaters, major department stores, specialty stores and a multitude of restaurants which are situated on the mall grounds. The restaurants represent something for everyone –steak houses, seafood, bar b cue, fast food, Mexican and more. Regional favorites such as Five Guys, the Filling Station (pizza buffet) are also close by to the mall area. If you want to save money or just enjoy dining on our oceanfront balcony, you will be able to find and buy groceries within just a few miles of the Bluewater. Food Lion is just five minutes away (with Big Lots right next door!) Members of Costco will find the Costco just adjacent to the Coastal Grand Mall as well as the Super Walmart for grocery and sundry shopping needs. Sam’s Club members will be happy to find this located just 15 minutes away. The new Market Commons shopping center is located just about a mile away down at the end of Ocean Blvd, across 17 business. Live theater shows are on just about every night and are just minutes away. The new Hard Rock Park is only 15 minutes away. Broadway at the Beach is about 20 minutes away. My wife and I stay at the Bluewater as frequently as we can. When you come to stay here, I am confident you will enjoy it as much as we do. Since Bluewater 502 is our “home away from home” and we have furnished it so we have everything we need in a comfortable yet relaxing atmosphere at the beach. Unfortunately, we cannot be there all of the time, so we offer you our home to enjoy your stay at Myrtle Beach. Color is fun! Our condo is full of fun “beachy” colors. Take your choice of which color Fiesta Ware dish to eat off of at each meal. Bake a cake, cook a turkey and mashed potatoes (electric hand mixer and turkey baster are part of the kitchen equipment as are a tea kettle, potato masher, steamer basket for seafood (one of our favorites is to steam shrimp and eat it out on the balcony for dinner!)) If you needed it and don’t find it, leave us a note in our comment book and the next time you return, we’ll have it in the kitchen! Our extra large balcony overlooking the ocean holds a dining table and chairs for al fresco dinning on the ocean – breakfast, lunch or dinner. The fully equipped kitchen will let you prepare your favorite meals and snacks in comfort and at your own pace. The balcony also holds two rocking chairs for unwinding while watching the ocean and the folks on the beach as well as for napping! My wife and I are retired, we enjoy traveling and spend a lot of time at the beach in Myrtle Beach. My condo is oceanfront at the south end of Myrtle Beach near Myrtle Beach International Airport. It is convenient to the airport but far enough from the flight path that you will hardly be able to hear the airplanes using the airport. It is also convenient to the restaurants and shops at Coastal Grand Mall, Market Commons, and Murrell’s Inlet. My wife and I bought this property because we love the beach and wanted a place at the beach to be our second home for long weekends, vacations, and retirement. If you love the beach as we do I am confident you will enjoy beach life in our home away from home at the beautiful Bluewater resort. Special features of my condo are a washer and dryer in the condo, fully equipped kitchen with full size appliances, and an extra large balcony. The only thing between my balcony and the beach is the oceanfront pool deck. The ocean view from my balcony is spectacular. The condo has central air conditioning, so there is no noisy compressor blowing hot air on the balcony. The condo has central heating. We provide sheets. Our cleaning crew provides clean sheets and makes the beds before our guests arrive. Our condo contains a stackable washing machine. Our condo contains a stackable dryer. The living room has an electric fireplace. We have free parking on the property. Guests must stop at the front desk to pick up a parking pass. We provide bath towels, hand towels, and kitchen towels. We do not provide beach towels. The kitchen has a full sized refrigerator with ice maker. The kitchen has a full sized glass top range with an oven. Our kitchen has a space saver microwave mounted over the range. The dishes are Fiesta Ware in fun colors. The kitchen is fully equipped for cooking meals. There are flat screen TV's in both bedrooms and the living room. Each TV is connected to cable. Our balcony is oceanfront 6 feet by 24 feet. There is a dinning table on the balcony where guests can eat meals. Our condo is cleaned, fresh linens are provided, and the beds are made before guests arrive. No housekeeping is provided during the guests stay. Stayed here for a week in March and I will definitely be booking again for next year. The views are incredible and the location can't be beat. Very easy check in and check out experience. Place was extremely clean and the beds were very comfortable. Everything was excellent. Very clean room, updated shower, great view, and great facility. Clean, easily accessible, good communications. Property Excellent, safe, clean. As Advertised. Joe was great. Our family stayed in Bluewater #502 for 1 week in August 2018. This was our first visit to Myrtle Beach. We had a fantastic vacation. This unit was everything we'd hoped and more. The unit has a double balcony directly facing the beach, with excellent views. The Bluewater property has multiple pools, including several that are shaded in the afternoon which is nice when you want to get out of the sun for a while. This is a large unit, is meticulously maintained, has a full kitchen and has a very useful in-unit washer/dryer. The owners were extremely helpful during our stay, including providing 2 pre-reserved beach chairs with umbrella everyday. We will definitely plan to stay here if we return to Myrtle Beach. Great size, great view, awesome beach access very nice well stocked condo.